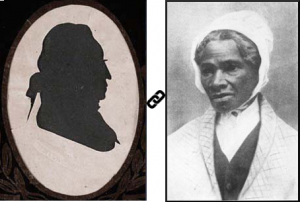 Dutch slave owners – What Exit? 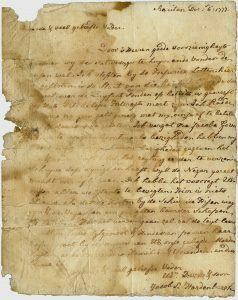 For people who are familiar with the history of Rutgers University, founded as Queen’s College by the Reformed Dutch Church in 1766, it will not be surprising that there are Dutch archival materials among the university’s Special Collections. Jacob Rutsen Hardenbergh (1735-1790), the college’s first president, was a member of the powerful Dutch Hardenbergh family that had settled in the Hudson valley in the 17th century. The philanthropist Henry Rutgers (1745-1830), after whom the college was renamed in 1825, was also a descendant from New Netherlands colonists. On the occasion of this year’s annual conference of the New Netherlands Institute, dedicated to New Jersey’s Dutch past, we have embarked upon a search for Dutch resources in our collections, some of which have only been accessible through a card catalogue so far. The provisional list that we came up with contains surprises. (Download the list.) Below are some highlights. The only Dutch document that has gained some attention in the past is the devotional diary that Dinah Van Bergh (1725-1807), daughter of a wealthy Amsterdam merchant, kept in 1746 and 1747. Her pietist faith inspired her to believe that God wanted her to marry the Reformed Dutch minister Johannes Frelinghuysen in 1750 and follow him to Raritan, New Jersey, where he was to serve as minister to three congregations. The diaries, of which the earliest part is owned by Rutgers and the second by the Sage library at the Theological Seminary in New Brunwick, is available online in an English translation, along with a few letters and a religious Dutch poem (view a publication of the diary in Dutch). Sadly, Johannes Frelinghuysen died in 1754, leaving Dinah widowed with two young children. When one of Frelinghuysen’s pupils proposed to her, the much younger Jacob Rutsen Hardenbergh (Rutgers’ future president), she again felt it was God’s will that she would serve as a minister’s wife in New Jersey and cancelled her plans to return to the Netherlands. 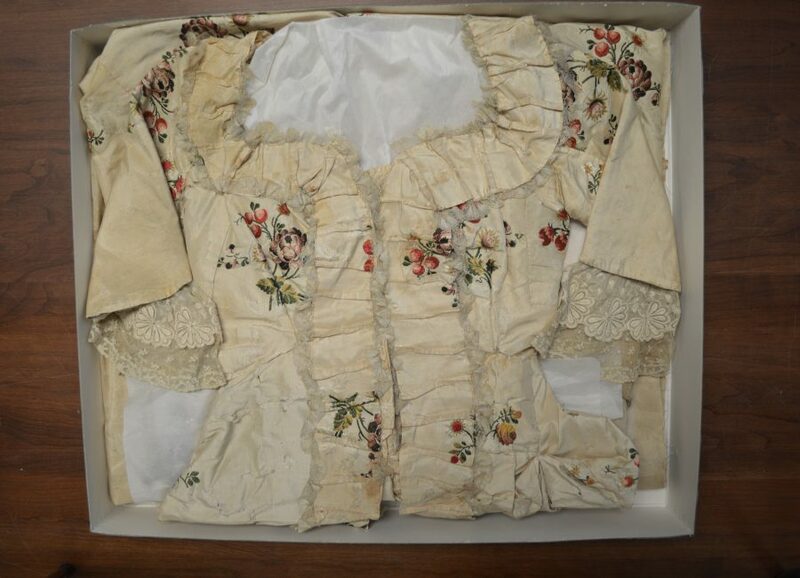 Her wedding dress, used for either her first or second marriage (or both), is one of the Dutch treasures at Rutgers University Special Collections. 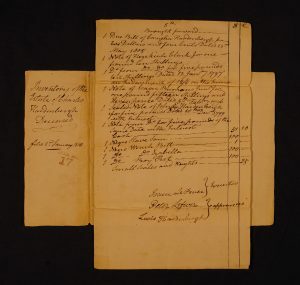 Of particular interest to local historians are two farm ledgers, kept by Johannes Gerardus Hardenbergh (1731-1812), cousin of Jacob Rutsen Hardenbergh. 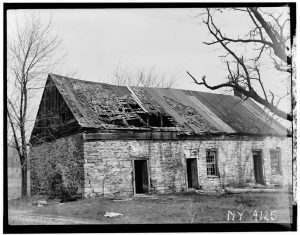 In 1762 he built a farm house at Kerhonksen, 16 miles from Kingston, Ulster County NY, later known as the “Old Fort,” where he raised his family and lived until his death. The house played an important role in the Revolutionary War: in October 1777 governor George Clinton ordered the government’s most important papers at Kingston to be sent there for safekeeping, only days before Kingston was torched by the British. 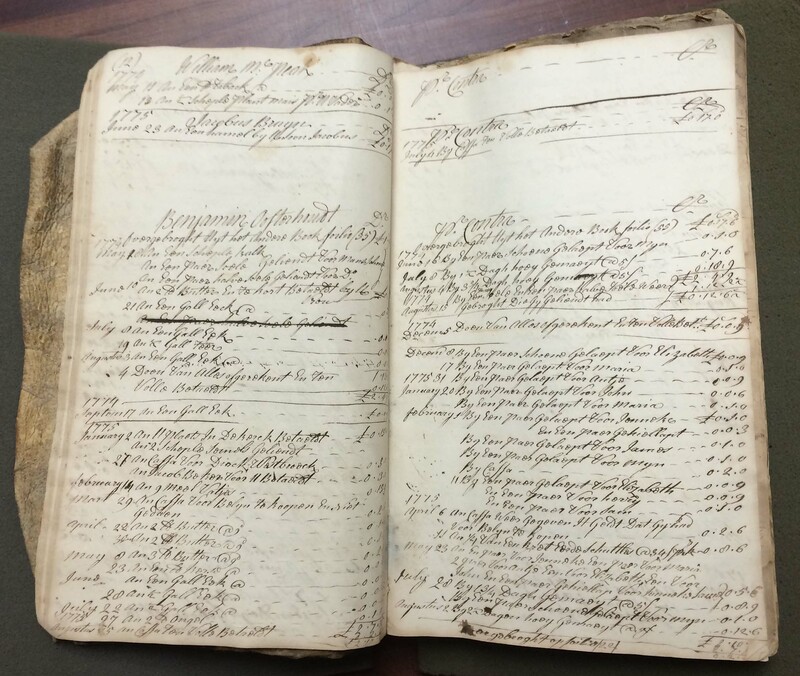 Hardenbergh’s farm ledgers, which span the years 1763-1794 (with references to a third volume), are an interesting example of a barter economy. Purchases by customers (mainly wheat, corn, and butter) are recorded on the left; payments were usually made in services rather than in cash, expressed in pounds under the heading “contra” on the right. Those services often included days of mowing, ploughing, spinning, or just “work” for somebody else. Particular services included the making of a coffin, or mending shoes for members of the family, as in the case of Benjamin Oosterhoudt (shown above). 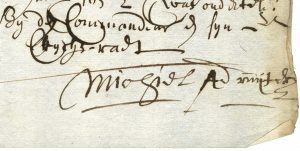 There are a few more individuals listed among the members of the household whose shoes were mended, with simple English first names, rather than Dutch. Could they have been Hardenbergh’s slaves? 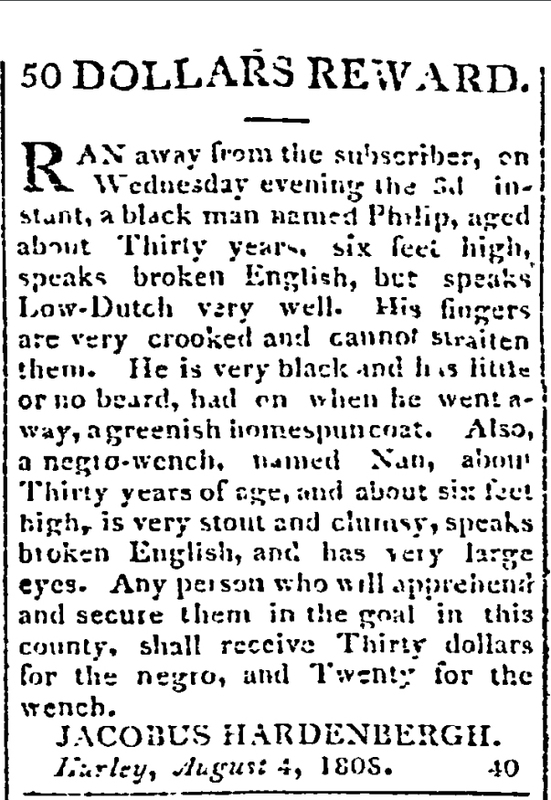 According to the first census records eleven enslaved people lived on his farm in 1790. A most interesting aspect of the ledgers is that all entries are written in Dutch, which may well have been the language spoken at the farm. 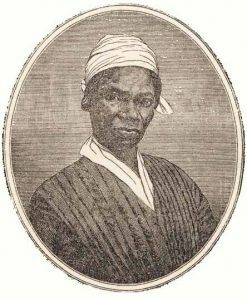 Dutch was the only language known to Sojourner Truth (c. 1797-1883) as a child. 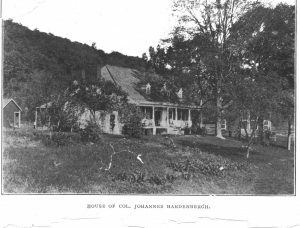 She was born enslaved in Swartekill, Ulster County on the farm of Hardenbergh’s cousin Colonel Johannes Hardenbergh (1729-1799), who was the oldest brother of Jacob Rutsen Hardenbergh. According to her personal narrative, in which she refers to her first master as Colonel Ardinburgh, her lack of understanding English caused her to be severely beaten by her new master, John Nealy in Kingston, after she was auctioned off in 1806. The ledgers raise the question who did the actual labor that was traded for the goods that Hardenbergh sold. 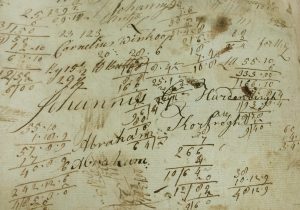 How many people doing the “work” recorded in the ledgers were enslaved? We will need more research to find out. Detail from John Romeyn Brodhead’s Dutch autographs collection…. Stay tuned! A final surprise found among the Dutch materials in our holdings is a folder among the papers of the historian John Romeyn Brodhead (1814-1873), simply labeled “early Dutch documents.” Brodhead, who spent time in Dutch archives to transcribe documents relating to New York’s colonial history, clearly had an eye for names of famous Dutch naval heroes and politicians. But that will be the subject of another post. Stay tuned!